Do You Want An Experience? Wait… There Is More – My recovery was remarkably fast. There was an unintended consequence of my rapid healing… I could now sense and perceive other body pains which had been masked by the surgery pain and the constant arthritic hip pain. The pain that now vaulted to forefront was that from my ‘good’ hip. Indiana Jones and the Hip of Doom – I now noticed that my ‘good’ hip was frequently sore and feeling like a groin pull. Well, much like an Indiana Jones movie where his plane to crashes over the Himalayas, then he rides on an inflatable boat and ride down the slopes into a raging river, he then falls into a crocodile infested river, only to reach the shores and find thousands of scorpions to escaping shore to find the next danger and a danger after that… It is sorta’ like my hip – one adventure seemingly is over, then another adventure begins. My bad hip has been successfully operated upon only now to find that my ‘good’ hip may require surgery as well. The ‘Scar’let Letter – At my one year follow-up visit I commented to my orthopod that my wife thought the scar was great and had suggested that he tattoo his name to his work of art. He casually mentioned that men often feel that way, but women, well, they don’t. They don’t like having to wear their scar, even though that few, if any, other people will ever see it. Do You Want An Experience? If you want to experience the full range of my hip replacement surgery saga, send me your address and I will have my mother-in-law stay with you for a week. Are You Experienced? 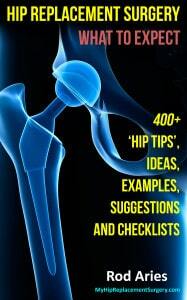 If you have had your hip replaced drop me a note. Hip Tip – Your Hip Pain Is Not Going To Get Better: Just in case you are a slow learner, like me, I will mention this one last time. Take actions sooner, rather than later. Any nonsurgical treatments are only temporarily making your hip feel better, but once your hip is arthritic and your cartilage is gone, hip replacement surgery is the best option for 99% of all people. Alrighty… that concludes Chapter 33.